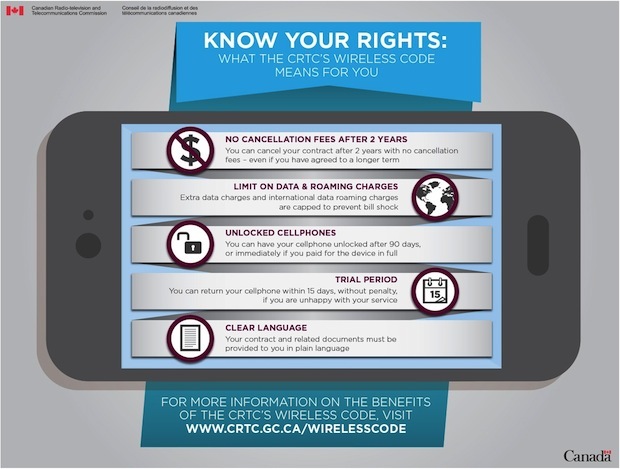 Earlier today the CRTC unveiled their Wireless Code, which aims to change the way wireless services are provided in Canada. Users will now be able to cancel contracts after two years without penalty and also get phones unlocked after 90 days into a contract (which already exists). “None of this is rocket science, but it all takes time,” Ken Engelhart, Rogers vice-president in charge of regulatory issues, told the news agency. Shorter contracts could also mean cellphone companies might offer smaller subsidies on devices — meaning customers might pay more up front for their phone, Engelhart said. “I’m not sure that this will be something that consumers are necessarily going to be positive about, but time will tell,” he said. Bell spokesman Paolo Pasquini told The Canadian Press that the company already provides customers with a number of ways to avoid signing a long-term contract and warned a two-year time frame could end up limiting their options. The CWTA, a lobby group on behalf of Canadian wireless industry, also went on to say technology development and major costs related to implementing these new changes could mean delays, but the industry “will work very hard” to meet code requirements by the December 2, 2013 deadline. What do you think? Is it worth it to pay more up front for you phone in exchange for two year contracts? It remains to be seen whether two year iPhone subsidy pricing will match those advertised in the USA.